Just click on the donation button to donate to Young Tiger's permenant educational fundraiser. All donations will be used for the Young Tiger's upcoming martial arts tournaments, martial arts educational traing and all related martial arts educational equipment and educational text. Below is my Official State Games & World Games Fundraising page. Click on the link below and it will take you to donate to the Fundraising of my 2016 State Games of America & my 2016 World Games XVI gofundme page. If it does not show up as a link, post it into your browser and click enter. Sponsoring a young pioneer can be a rewarding experience for the youth as well as our community. Currently Young Tiger Cordy is on his way to the Virginia State Championship. As a business owner you have a unique oportunity to become a leader in our community by leading in the help to sponsor a young and upcoming pioneer. During his run for State Championship, Cordy will be in many photo shoots, a show of support will be seen by thousands of people. The sponsors shirts have many locations, don't hesitate to secure your desired position. Many Logo locations are available, but many will be taken as sponsors come out to show their support. Sleeve, Shoulder & Back locations are also available. There are several ways to donate and or sponsor "Young Tiger". Remember, This is a family oriented site. (1) Click on the Secured PayPal button and send your personal donation. (2) Send your donation to our secured mailing address. (3) $300.00 will secure your logo on the sponsors shirts for the entire year of 2016. (4) $500.00 will secure you an Ad on the site for the year and a location on the sponsors shirts. (5) $1,000.00 or more will secure your logo location for 2013 & the beginning of 2016. More Fundraiser information being added. Check back for updates. Portsmouth’s youngest rising star is on a path to the National and Wolrd Championships. At these times in our current economic status, its hard to fathom a dream. We dare dream the dream, we are on a path to that dream. We can do it with the help of our community and businesses. 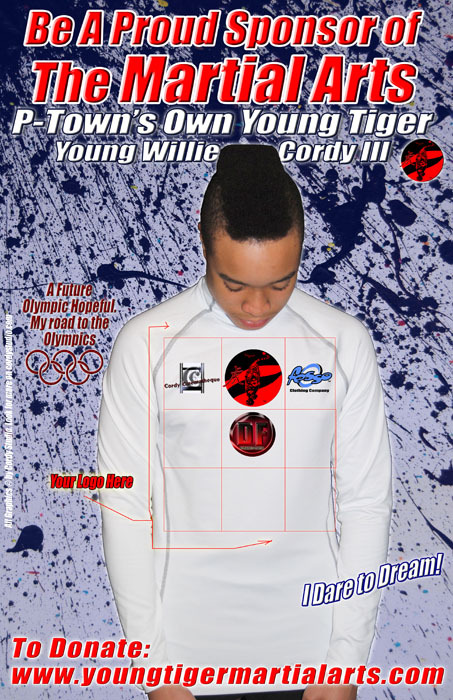 In 2013, Young Cordy won Silver at the World Martial Arts games in Dublin, Ireland. He represented the United States as an ambassador of sports as a member of Team America. In 2012 young Cordy bought home 4 State Championships, 2 from The Comonwealth Games of Virginia and 2 from The Virginia Karate Alliance. Now he has qualified for and is representing Virginia in the State Games of America. This year we are also pursuing an AAU ranking. Our long term goal is to reach the 2020 Olympics. The path that we have in front of us starts with the National Championship. Young Cordy placed at the top in the state in his division. A little history behind the Cordy family starts with me, Willie Cordy Jr. I trained in Atlanta at the “Tai Chi Association” in Decator Georgia under Master Chong. There I learned Traditional Shaolin Kung Fu. As my son reached the age of two he constantly asked to learn martial arts. Events bought us back to our home in Portsmouth Virginia where my son Willie Cordy III started his training at the “Authentic School of Karate” under the Hunter Family which is now known as “Tiger Martial Arts Academy”. Willie started training at four years of age. After years of training he has become the youngest black belt to come through Tiger Martial Arts Academy. Reaching black belt at the age of nine beating out his teacher who reached it at the age of ten, along with his current training he now takes on the art of Jiu Jitsu, and Muay Thai Kick Boxing. Young Cordy is pursuing his black belt in Taekwondo at Park's Taekwondo. Young Cordy also studies Wing Chun under the tutelage of Sifu Gorden Lu, son of LoMan Kam, and great nephew of Grand Master Ip Man. Young Willie Cordy excells in martial arts education. He has a curiocity for many styles and techniques, help us in our quest to educate young Cordy in his martial arts education in future studies. Sponsoring us in our quest for National & World Championships can help you as well as our community. When you sponsor a young homegrown star, you sponsor up and coming youth with ambition. Our hope is to help build better youth into better students and help guide them into adulthood. With your help it can be possible. For our sponsors, we will also inform our community of your contributions in helping our goals. Your contributions will be used to help advance our goals toward The National & World Champion and push for more martial arts education. The benefits to you for helping us will be; (1) When we succeed, and we will, you succeed. (2) On every promotion that we distribute and post, your logo and or name will be promoted as well. Competing and raising funds are hard, every little bit counts. We are seeking support in many ways. How can you help you ask, possibly Financial, in-kind donation contributions, gas cards for reaching our destinations, ect. One of our future goals is to reach the 2020 Olympics. We will not stop, reach deep and help be a part of that dream. In closing, a sponsorship from you could mean the difference in helping reach young Cordy’s dream.